However, a fundamental obstacle hindering practical applications is the lack of stability under ambient conditions, given that BP is highly reactive to oxygen and water, resulting in rapid deterioration of its electronic and optical properties. This has started a new wave of exploring black-phosphorus-analogues (BPAs), 2D materials that share a similar folded structure with BP and exhibit a tunable band gap, high carrier mobility, and high ON/OFF ratio but with high environmental stability. The appeal of the significantly improved environmental stability of BPA-based devices shows for large-scale applications has already been discussed in a previous Nanowerk Spotlight (« Black phosphorus analogues: Emerging photoelectric materials »). In new research, led by Professor Han Zhang at Shenzhen University in China, and published in Journal of Materials Chemistry C (« Black-phosphorus-analogue tin monosulfide: an emerging optoelectronic two-dimensional material for high-performance photodetection with improved stability under ambient/harsh conditions »), researchers demonstrated both excellent photoelectrochemical (PEC) performance and significantly improved stability based on tin monosulfide (SnS) nanosheets. These findings hold great potential for practical applications of BPA nanomaterials-based devices. In this work, the size-selected BPA SnS nanosheets were successfully fabricated by a facile liquid phase exfoliation method, followed by a liquid cascade centrifugation (LCC) technique. The size dimensions of as-prepared 2D SnS nanosheets obviously decrease as the LCC progresses. Interestingly, due to the narrow band gap of SnS, high carrier mobility and high stability, the as-prepared SnS nanosheets can be employed in high-performance photodetectors. The team demonstrated that, for the first time, SnS nanosheet-based photodetectors exhibit an appropriate capacity for a self-powered broadband photoresponse. 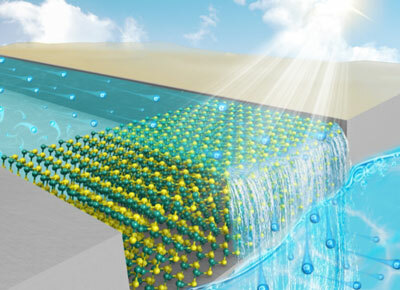 More importantly, due to the weak polar character of Sn-S bonds, the SnS nanosheet-based photodetector shows strong long-term temporal and cycling stability of ON/OFF switching behavior without any external protection – not only in regular basic electrolytes but also under strong polar conditions including harsh acidic and neutral electrolytes. The authors anticipate that SnS as an emerging optoelectronic material might be developed towards versatile applications such as photodetection, sensing and modulation, and could provide a new platform for the design of BPA nanomaterial-based PEC-type devices with practical application ability.